In our visit’s protocol we make a deep visual exam. We evaluate if there is any problem of focusing (myopia, hyperopia, astigmatism) and assess if the visual system works properly and efficiently. Occasionally it can exist a proper focusing (absence of diopters) but even so there are symptoms of eyestrain (headache, itchy eyes, difficulty of maintaining the text focused while reading, occasional double vision, lack of concentration, etc.) These are signs that our visual system does not work properly. All of these problems are only perceived thorough an exhaustive visual examination. 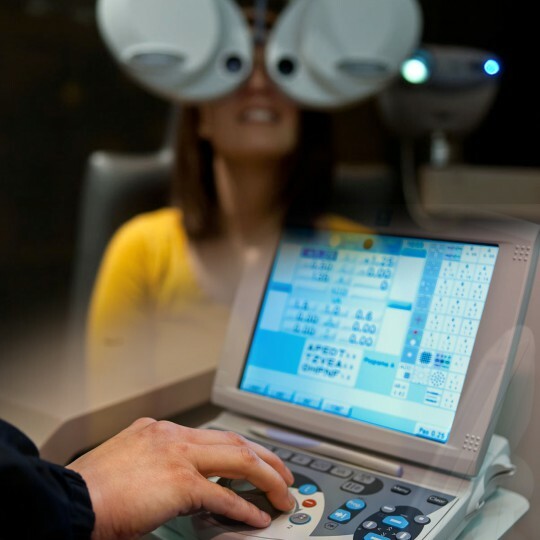 In order to confirm the good health of your eyes we include tonometry (eye’s pressure control) and retinography. Retinography consists of a picture of the ocular fundus that let us to evaluate the health of retina through a telemedicine service: we are integrated within OPTretina, the first network of optician optometrists dedicated to blindness prevention.